You are located on the second floor, but I have some handicapped guests. Does Flinn Block Hall have an elevator? Where will my guests be able to park? Does your venue allow alcohol service? Can we choose our own vendors? Can I do both a ceremony & reception? How does this venue compare price-wise to others in the area? Will I be able to decorate to get just the look I want? Why would I want to have my summer wedding indoors, when Oregon has such nice weather in the summertime? Is it easy to decorate? How do people usually decorate Flinn Block Hall? Will my guests be impressed with Flinn Block Hall? I've always wanted a summer wedding -- but my fiancé is worried about being uncomfortable after attending an outdoor summer ceremony. Do you have air conditioning? How big is Flinn Block Hall? Can I have a real band for my wedding music? Does your venue have a built-in sound system? One of my relatives wants to make all the food for my wedding. Can she do that? What food facilities do you have available at Flinn Block Hall? chairs? I like that you include chairs and tables, but can I bring in other rental chairs? Yes! We are fully handicapped accessible, with an elevator that we use for guest access as well as equipment loading and unloading. Our restrooms are upgraded with grab bars and wheelchair access as well. Downtown Albany has many free public parking lots, and we have a large one right across the street, as well as 2 large lots less than a block away. Albany also has no metered parking, so your guests can easily park on the street as well. Yes, we do! There are no corkage fees, and we do not charge any additional fees for liquor service. We require an OLCC-licensed server and host liquor liability insurance, and you may choose to hire your own server or go through your caterer. Yes you can, and it’s one of many things our clients really appreciate. You can choose your own caterer, photographer, videographer, DJ, officiant, etc. But we also give you some suggestions to help get you started! Yes, you may do both or either in the main ballroom, depending on how you set up the room. We provide you with a room floorplan to help you plan it all out! We hear often that our rates are very favorable compared to the other options in our area, especially when assessing what we provide. Flinn Block Hall is dedicated to helping you create a celebration within your means. Tables and chairs are always included, and our very simple rates and add-ons allow you to mix and match which features are important to you. We offer linens separately, as well as our dressing rooms. If you are getting married in a church, you may not need dressing rooms, so in that case you may choose not to pay for them. We have no exclusive vendors here, so you can choose vendors like DJs & caterers that fit your needs and budget, & we’re happy to provide suggestions to get you started finding just the right people. Yes! Many different rental items and equipment are brought in to Flinn Block Hall all the time. You will be well-equipped with all the information you need to easily decorate within our simple guidelines. We allow decorations to be hung from our wonderful overhead beams, and on the columns around the room with 3M Command system attachments. We allow real candles, too! While that’s largely true, rain is not the only weather factor that can make an outdoor celebration uncomfortable. Extreme heat, unseasonably chilliness, or a windy day can make an outdoor wedding less than a dream day for everyone. Bugs, noise, and unpleasant smells are other examples of why outdoors is often less appealing than indoors. Flinn Block Hall’s large windows span the front of the venue & give you a beautiful view of the outdoors, with none of those unpleasant concerns, & our heat and air conditioning make for comfortable celebrations at any time of year. Yes, linens are available for rental from Flinn Block Hall. We offer tablecloths in white, black or ivory, and napkins in a wide assortment of colors. You are also welcome to rent elsewhere, or use your own. Yes, the room is beautiful on its own, so you can choose to do very minimal decorating such as tablecloths and simple table arrangements, and the space will be lovely without much effort at all. For those who want something more elaborate, the room provides a backdrop which is neutral enough to accommodate all color schemes and extra decorative touches. Vintage-themed weddings are very popular here, and we also see many elegant, urban or industrial chic weddings as well. A current beautiful trend is bringing the outdoors in, sometimes with a garden theme including abundant plants, garden urns, & floral arrangements! Check out our Photos for inspiration. Absolutely! We hear all the time “our guests raved about the venue!” This historic building has been painstakingly restored, inside and out. Vintage brick makes a beautiful backdrop for so many different styles. It always looks very festive with white lights sparkling from the overhead beams & highlighting the antique fir floors. It’s a beautiful combination! 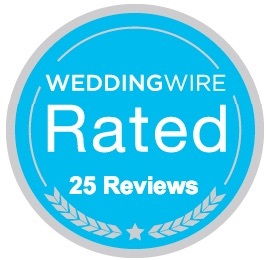 Yes we do, and it’s one of the features that make summer weddings wonderful here! It’s cool and comfortable throughout the main room, and the dressing rooms have separate controls to get just the temperature you want. The main room is 3,000 square feet. Yes, Flinn Block Hall always includes tables and chairs. We have 60″ round tables, and several 6-foot tables. You are always welcome to bring in your own tables or most other decorative furnishings as well. Yes! Bands, DJs, and bringing in speakers and a computer are all permitted. You are welcome to hire a DJ or bring in your own equipment to take advantage of our great acoustics. Flinn Block Hall does not have its own sound system. Yes she can! We don’t require licensed caterers at Flinn Block Hall, and we have no additional charge for self-catering. We have great space for prepping food, and we have several large commercial refrigerators on site, as well as several sinks. In addition to our 17-foot bar equipped with a large undercounter refrigerator in the main room, we also have a separate food prep area, complete with two large catering fridges, sink, and spacious countertops. Food preparers can warm food in large slow cookers, or bring food in cooked & kept warm with canned heat and chafing dishes. Since we do not have an oven, stove, or ventilation hoods, no actual cooking is permitted here — all caterers are well-equipped to bring in food already prepared. A few chairs, for example for a head table, are permitted if the chairs have felt pads attached to the base of the legs. Rental chairs are only allowed in large quantities (+10) if they have firmly-attached rubber feet. Our clients bring in all kinds of furnishings & equipment — just ask when you come for a tour.